With this tutorial, we will explore some of the features of enchant.js and use them to create a simple game. We will cover backgrounds, sprites, user input, animation, labels, collisions, game logic, and sound. First, click on this link to the project files here. If you don't already have one, you'll need to create an account in order to fork this code. Once you do, you can work on this project right out of your browser, and it already has all the assets that we need. The interface is pictured below in figure 01. The top left frame is where the game will apear. The dropdown menu in the center allows us to select which text file we're editing. 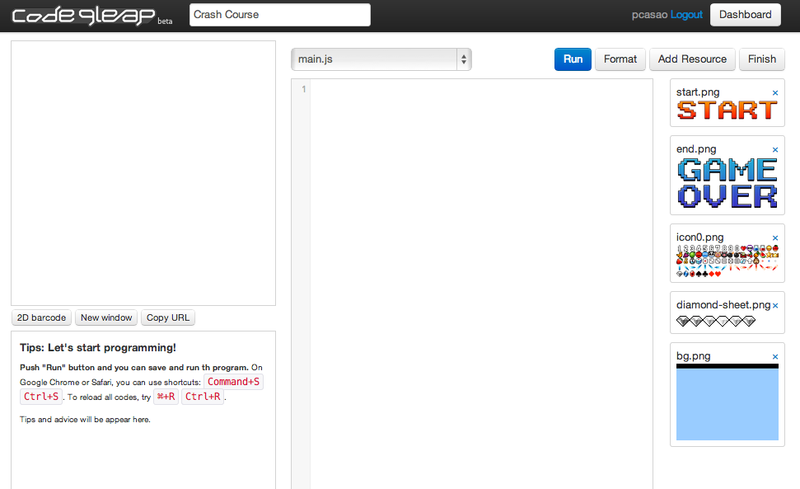 For this tutorial we will only make changes to the main.js file. On the right side is the list of the assets that we will use. To run your game, simply click on the blue RUN button up and to the right of the screen. Let's look at the main.js file. Some of the comments are numbered. The number before the comment indicates the section of the tutorial in which we will make changes. This is the skeleton code that we will be adding code to throughout the tutorial. Now that we're ready, let's start by adding a background. Note: Preloaded assets will be indexed from the current directory of the .html file. This is enough for our current tutorial. However, if you start working on this locally, I highly recommend organizing your assets by type. For example, you would store bg.png in an images folder and preload it by adding 'images/bg.png' to the preloader. Now that it's preloaded, we can add the sprite. This will add the background sprite at the location (0, 0). Confirm the background sprite has been added by clicking on the RUN button in your browser. You should have a blue background with a black bar along the top. This is shown below in figure 02. Let's move on to adding player sprites. Unlike the background sprite, we will create a class for the player sprite. An empty class is provided under the comment 02 Player Class. Let's begin by examining the empty class. It contains two functions: initialize and onenterframe. Under initialize, we can initialize attributes like x-position, y-position, scale, frame, etc. You can find links to more about the attributes in the References section. Under onenterframe, we can add game loop code. Code added here will be run every frame. We can add code that responds to user input here, as well as different condition checks. Let's place it in the center of the stage by setting its x to the center of the stage width, and the center of the stage height. Press the RUN button to confirm that the player has been added. This is shown below in figure 03. Now that we've added the player to the game, let's have it respond to keyboard input. Go back to the Player class. By default, enchant.js has six input buttons that may be bound to any key with an ASCII value. These buttons are left, right, up, down, a, and b. We will be binding them soon, but for now let's leave them at their default bindings. Note: Remember that increasing the y-value will actually move the sprite downwards. Now we should be able to move the sprite using the arrow keys. Test this by clicking the RUN button on codeleap. Let's go back and bind the buttons to different keys. To do this, we use game.keybind(ASCII_VALUE, 'BUTTON_NAME') where ASCII_VALUE is the integer value that represents a key and BUTTON_NAME is the name of one of the buttons. This will bind the direction buttons to the W, A, S, and D keys. Confirm this change by clicking on the RUN button and testing it. Note: To test the key bindings, click on the "New window" button underneath the game frame. A new window should pop up and it should read in your WASD key input just fine. Now that we have keyboard input working, let's add mouse input. enchant.js treats mouse clicks like touch input and vice versa. We will add mouse input as an alternative method of moving the player. After clicking on a particular spot on the screen, the player sprite will move towards that spot. First, let's add some variables to the player sprite class, as well as some update code. This initiailizes the variables tx and ty to x and y, respectively. tx and ty will represent the coordinates of the mouse click location. This will add 1/4th of the distance from tx to x and ty to y until the player sprite reaches the mouse click location. This will add an event listener that responds when a touch or mouse button is released. This means that until you actually pull your finger away or let go of the mouse button, this event will not occur. Every time this event occurs, the tx and ty are set to the click location. We subtract 16 from its x and y in order to account for the size of the sprite. Confirm that the mouse input works by clicking the RUN button. The player sprite should now follow your mouse clicks. Nowever, now we've broken keyboard-based input. If you try to move, you can't move very far from the location defined by tx and ty. To remedy this, we're going to force tx and ty to update every time we press one of the input keys. Click on the RUN button in your browser to confirm that keyboard controls have been fixed. Now that we have mouse and keyboard input working, let's add some animation. For this step we will be using an asset we preloaded in step 01 called diamond-sheet.png. Let's begin by creating another class that uses the diamond sheet. We'll simply gall it Gem. These x and y coordinates place the gem in the top right corner of the screen. We'll set the frame to the first frame of the animation, which is indexed at 0. In this code we're using an attribute of the sprite called age. It's incremented once per frame. Using the mod function on age, we update the sprite every 2 frames. Once it reaches the last frame of the animation, we reset it to the first frame. Confirm that the animation works by clicking on the RUN button. It should appear like figure 04 below. The sprite will scale in the x-direction between 1 and -1, giving it the appearance of a flat shape rotating in place. Note: This effect is more succesful with sprites that are vertically symmetrical. Now that we have a handle on animation, let's move onto labels. This code moves the scoreLabel to the center of the screen and sets its color to white. You can move the score to the left side of the screen by removing the line that changes its x attribute. This will add the label to the scene. Confirm that the label is correct by clicking on the RUN button. The scene with the scoreLabel added is visible in figure 05 below. Now that we've got a score counter, let's move on to collision detection. To put it simply, collision detection involves checking whether or not two things are touching. What happens after that point is up to you. 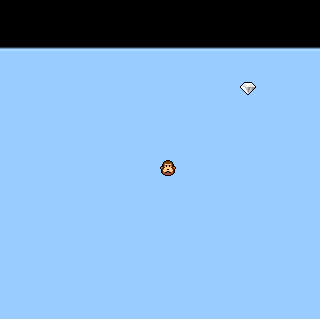 In this section, we will simply remove the gem once it collides with the player sprite. This will check if the gem is intersecting with the player sprite, and makes a call to game.rootScene to remove it from the game. I've also included a lin to increase the game's score by one. We will address this, as well as explore collision detection further in the next section: Game Logic. Now that we have the necessary tools under our belt, let's turn this code into a simple game. 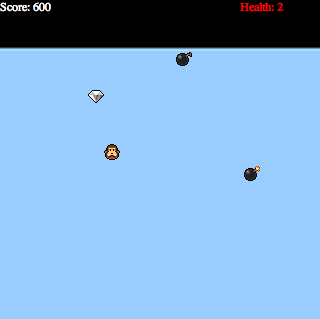 We will have the game spawn gems for the player to collect, and bombs for the player to avoid. Using the collision detection code, every gem collected will give the player 100 points, and every bomb collected will subtract one point of health. This will create a new label that keeps track of a player's health. When the player's health drops below 2, it will change the color of the label from white to red. Now that we can track player health, let's add the game over condition. This will end the game as soon as the player's health is less than or equal to 0. 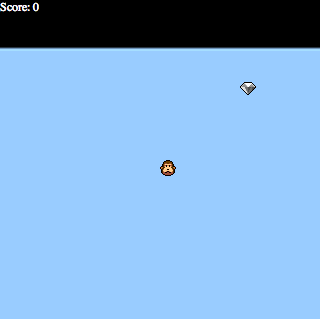 Click on RUN in your browser to test your simple game. The completed game should look something like figure 06 below. We won't be able to implement sound on 9leap, but let's dicuss it in the next section. For now we can't use sound on code.9leap.net, as it doesn't allow us to add sound files to the resources. I'll still explain how to use it, in case you'd like to download the resource files and work on it on your own. Now when the player touches the gem, the sound will play as the gem is removed from the game. This will start the music up again once the track stops playing. I've included some links that might be useful if you want to look into using enchant.js more. This is the official enchant.js website. You can download the source file to work on it for yourself here. This is the Documentation section of the official enchant.js website. You can find out more about Sprite attributes and other classes here. This is the code site for 9leap. You can write example code, share it with others, and have them fork it here. This is a site that hosts games built in enchant.js. It is in Japanese, so it's a little tricky to navigate. I recommend throwing the URL into google translate.